Syria has always been strategic throughout recorded history. You had to pass through it between Babylon and Egypt. 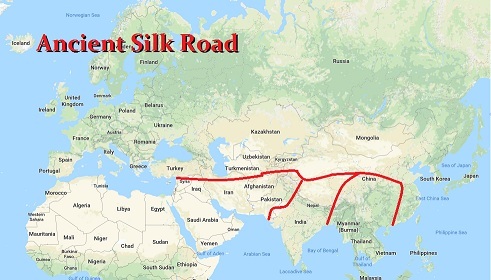 However, as world trade began to emerge, the connections between China and the ancient Roman Empire were fully developed through the Silk Road. Spices were always worth their weight in gold and even during the Middle Ages, bankers were called “pepper-men” because pepper was more valuable than gold by weight. Following the death of Alexander the Great in 323 BC, his generals divided up the territory he had conquered. 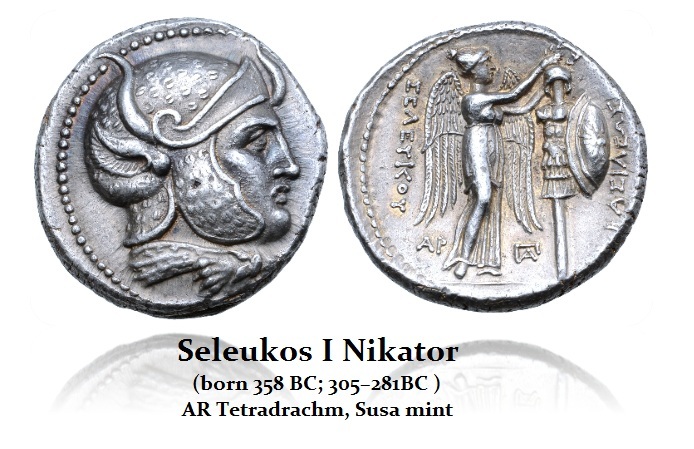 After the Battle of Ipsus in 301 BC, Seleucus I Nicator (458-281BC) won the territory of Syria. Seleucus founded four cities in northwestern Syria, one of which was Antioch. He named this city in honor of his father Antiochus or perhaps his son who was named after his grandfather. It was founded on a site chosen through ritual means. Reportedly, an eagle, the bird of Zeus, had been given a piece of sacrificial meat and the city was founded on the site to which the eagle carried the offering. Seleucus did this on the 22nd day of the month of Artemisios in the twelfth year of his reign, which in modern terms was May 300 BC. Antioch quickly rose to become the Syrian capital. Antioch flourished due to trade. Caravan merchants began to bring goods from China to the marketplace in Antioch. This was the beginning of the Silk Road in ancient times. Antioch benefited from Roman rule. The Historia Augusta mentions a great fire in Antioch, implying that the emperor Antoninus Pius (138-161AD) offered help to restore the city because it had become the gateway to a fabled great empire in the East. This legend of a great Empire in China had even inspired Alexander the Great to attempt to reach it giving up in India. Antioch became an extremely important port of trade in the ancient world. It flourished and any major natural disaster would send financial panic down the banking street in Rome – Via Sacra. Such financial panics would appear during earthquakes that struck Antioch as recorded during the reigns of Tiberius (14-37AD), Caligula (37-41AD), Hadrian (117-138AD), and Diocletian (284-305AD). Its governor Pescennius Niger (193-194AD) proclaimed himself emperor. Niger lost the war against his rival Septimius Severus, (193-211AD) who temporarily took away the independence of Antioch, giving it to Laodicea to control as punishment. During the 3rd century, Antioch was the city of innovation. Street lighting appears also in this city during the 3rd Century AD as Saint Jerome (345-420AD) commented in his writings that the capital of ancient Syria was lit up at night by oil lamps hung over ropes that were strung over the streets. By 371AD, this invention spread to Caesarea in Turkey. China, on the other hand, was reported to be lighting up its streets using natural gas supplied through bamboo pipes by Medieval times. China, that legendary empire of the East, throughout history became rich by trade with the Roman Empire. Yet the history of Rome that claimed to rule the world (orbis terrarum) stood at the opposite end of the world from the strikingly similar Han Dynasty (206BC-220AD) in China, which also claimed to have ruled the world (tianxia). The scepter of Maxentius (306-312AD) is the only surviving scepter of a Roman Emperor. It shows the earth as round proving they knew that even in ancient times on both sides of the world. There is the History Book for Tang-Dynasty in China covering the period 618-907AD. Yet the text mentions 17 times what appears to be the Roman Empire. It also describes an envoy that was sent by the Roman Emperor to China. The Roman Emperor was recorded to have been “Anton” . The account of such an envoy sent from Rome who visited the older Han Dynasty predates the Venetian traveler Marco Polo (1254-1325) by more than 1,000 years. This envoy has been attributed to 166AD during the reign of Marcus Aurelius Antoninus (121-180AD). It is the death of Marcus Aurelius, that has marked the peak in the Roman Empire and the turning point that begins the Decline and Fall of the Roman Empire where its monetary system collapses just 72 years thereafter. This envoy established diplomatic contact at the peak of the Roman Empire from which a disastrous decline begins. Any political-economic aspirations to further such a relationship would then die with Marcus Aurelius. Yet also, both empires would suffer the same fate of barbarian invasions. The Han Dynasty falls in 220AD from which emerges the chaotic period known as the Three Kingdoms (220-280AD) – the division of the once unified Chinese Empire. There is hard evidence which demonstrates that there was direct contact between Rome and China going back to the period of 180AD. The connection point between East and West has ALWAYS been Syria. China is also backing Syria with money. The Chinese are looking to build on the old world power position of the historic Silk Road (One belt, one road). China has never actively participated in the war militarily but has ensured financing their goals. Syria maintains close economic relations with Russia and China because of the stupidity of the West, which began with stopping a pipeline to compete with Russia. Likewise, despite being a member of NATO, Turkey is flirting with the expansion of Turkish-Chinese relations in addition to it historical ties with Russia. As strange as it might sound, China has more skin-in-the-game with Syria than Russia. The Russians had to intervene after (1) the US was conspiring with Qatar to get a pipeline through Syria to compete with Russia selling energy to Europe, and when became apparent that the international and Islamist mercenaries also posed a threat to Southern Russia. Russia and China clearly complement each other on the worldwide stage of politics. Both suffered Communist revolutions and they are the most important security players in that part of the world. China has provided the economic security while Russia provides the military security. Syria is the focal point in the Middle East. It is where all the power meets for economic reasons. This seems to be the way for thousands of years.